Looking up at Hermits Rest from Breezy Point just before the trail descends the Redwall section known as Cathedral Stairs. 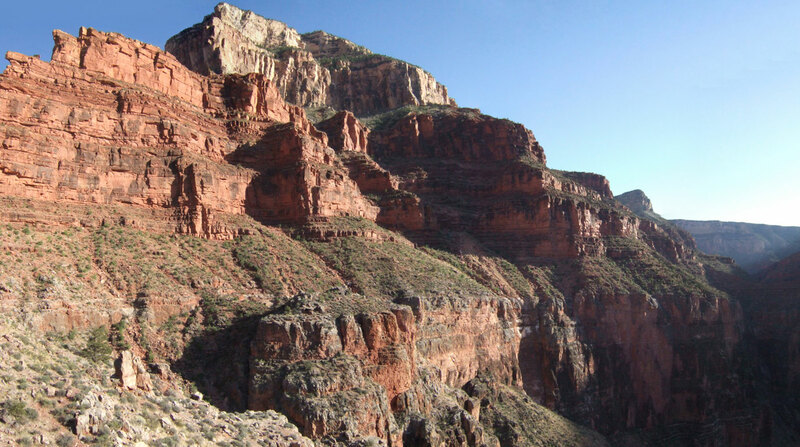 The first day of a family loop-hike following the Tonto east to Indian Garden and out Bright Angel. Clear Creek hikers almost always make some exploration upstream toward Cheyava or downstream to the river. Every part of this area has something special. 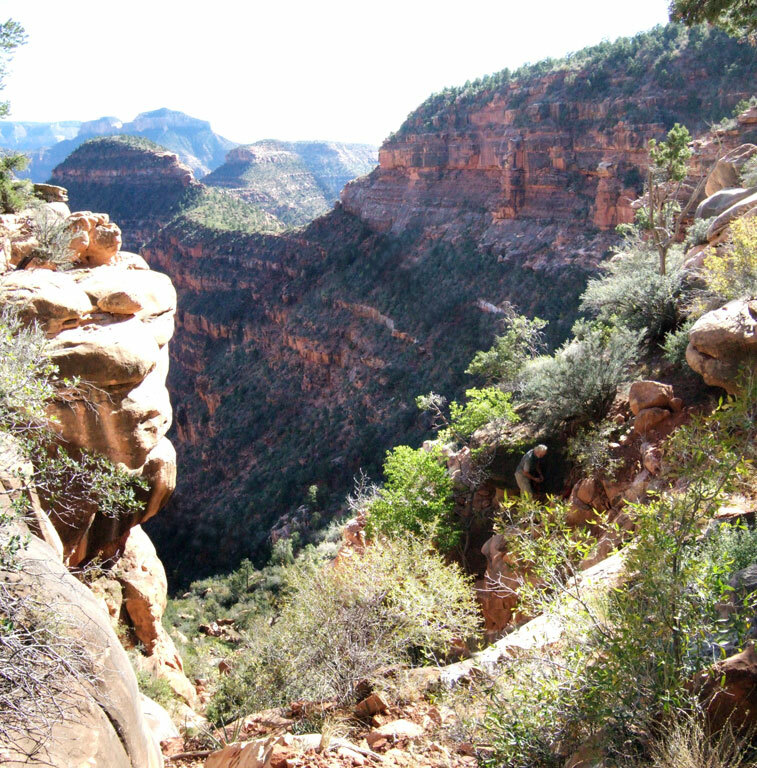 This photo view is looking down just before the really narrow section of the east fork. There is no water in the streambed here, but don't stop here -- keep going for more discoveries and allow all day to get to the end and back. 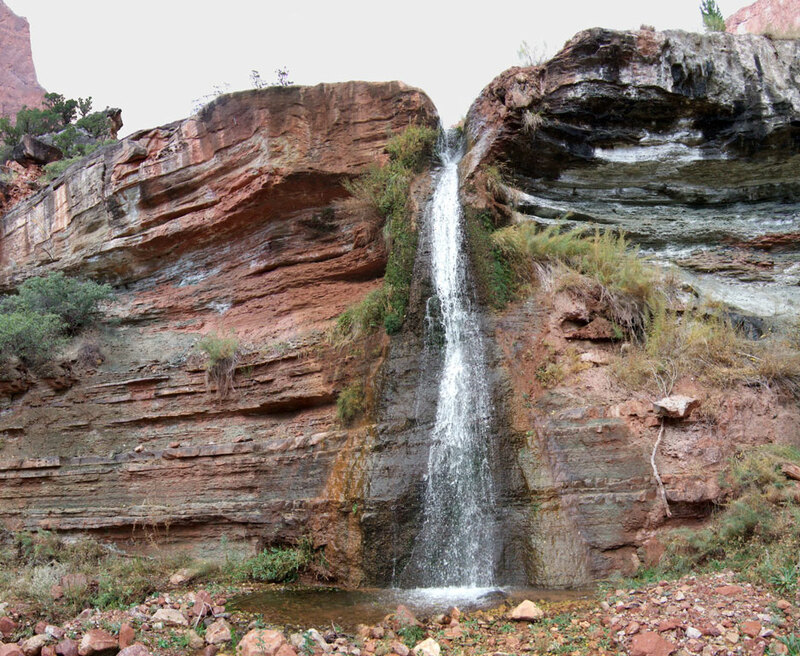 Ariel Falls is truly one of the loveliest of any in Grand Canyon -- not one of the tallest, most dramatic, or most popular. Difficult to capture in one image this is another composite wide-angle view from up close in 3x3 frames. The view is from just above the critical Esplanade layer barrier cliff climbing out of Modred Abyss to Elaine Castle and Lancelot Point in the remote upper reaches of Shinumo Creek. Co-explorer Bob Hostetler is in the foreground placing a handline to assist climbing up with packs. The previous year before this photo I attempted to locate the old Tonto section of North Bass Trail where it leaves White Creek. I was in the right place but could not discover anything recognizable beyond the first switchback. 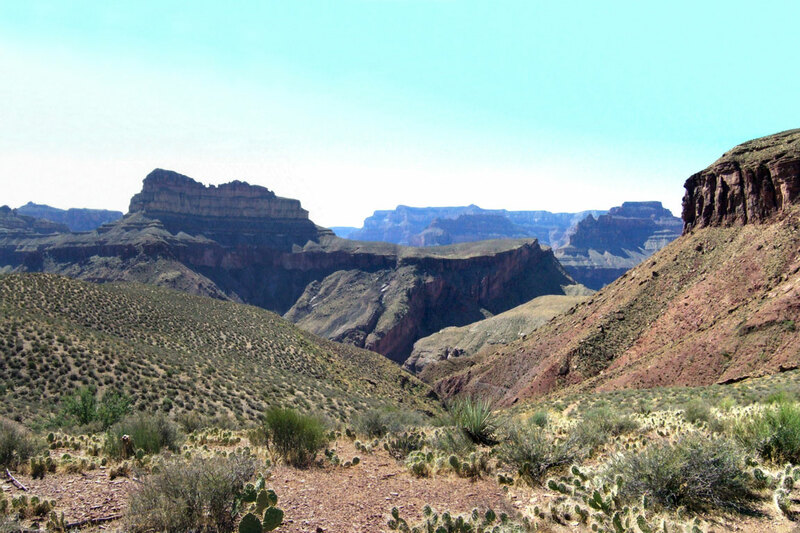 This year, the trail had just been restored and rebuilt by volunteers with guidance from Grand Canyon trail historian Mike Anderson. A section of restored trail can be seen across the red Dox slope descending toward Shinumo Creek. Nice work! !